Here is an interesting situation that I am told is representative of an increasingly common occurrence, especially in junior golf competitions. A doting mother was following the progress of her child prodigy son around the course and had noticed that he was lifting his club too steeply on his takeaway. On the next teeing ground she pulled him aside and told him what she thought that he was doing wrong on his backswing. He said nothing and carried on with his game. Two holes later she again called him over and told him that now he was not transferring his weight at the top of his backswing. I will return to whether the player incurred a penalty, or not, later in this blog. Q. A team competition is being played, and in the conditions the Committee has not authorized captains or coaches to give advice under the Note to Rule 8. 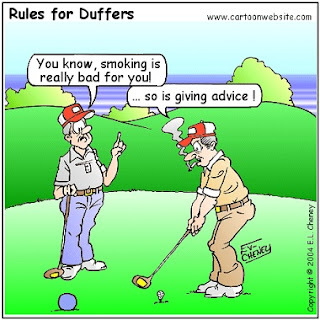 A non-playing coach or captain gives advice during a round to one of the members of his team. What is the ruling? A. There is no penalty. However, the player should take action to stop this irregular procedure. If he does not do so, he should, in equity (Rule 1-4), incur a penalty of loss of hole in match play or two strokes in stroke play in view of the purpose of Rule 8-1. So, Rule 8-1 prohibits a player from asking for advice from a spectator, but does not prohibit a player from receiving unsolicited advice, because the player is not in a position to control such an act. However, once a spectator has offered unsolicited advice the player must take an action to prevent it from happening again. If they do not, they risk incurring a penalty for a breach of the Rule. One can imagine a situation whereby a particularly stubborn spectator (parent!) might continue to offer advice, but providing the player makes their best effort to stop it happening, it would be extremely harsh for them to be penalised for it. Advice does not have to be spoken. Actions can constitute advice. For example, if someone holds up a number of fingers indicating the club that they recommend the player should use, it is the same as if they had spoken the number when assessing whether a penalty has been incurred, or not. The two main points to remember from the above is that players must not initiate any communication that leads to advice being received from an outside agent and that they should try and stop any unsolicited advice being offered to them. My thanks to those of you that have bought my eBook, '999 Updated Questions on the Rules of Golf', through Amazon; it has helped me make their US top 100 golf books list again. However, if you purchase from my 'Rhodes Rules School' web site, I will send you, not only the Mobipocket eBook file for eReaders, tablets, notebooks and smart phones, but also a .pdf file so that you can print out any sections that you want on any computer. I have been reading your blog for a long time. Now I have a rules question to ask. A couple weeks ago, I refereed in a junior tournament, in which there was a ruling I am still not sure if I am right or not. A player drove his ball into a bush, thinking he could find it so he did not play a provisional. When he got there he could not find his ball. At that time, a course manager (with a cart but not have "rules official" label) appeared and ruled the player should drop a ball nearby the bush, under one stroke penalty. Since that course manager looked like a referee and the player acted as what the managed said. Next hole, the player and his fellow competitors saw me and asked me if the ruling was correct. Then the problem was brought to light. I ruled that the player was a 2-stroke penalty, waive of DQ penalty from playing from wrong place and gain significant advantage. Unfortunately, your ruling was not correct. The only way that a player may proceed when they have lost their ball is to return to where they last played from and play another ball under penalty of stroke and distance. Whilst I am sympathetic that the player was told something different by someone whom appeared to have authority, this incident concerns a fundamental Rule of Golf that every golfer should know. It is a player's responsibility to know the Rules, Rule 6-1. If it was a strokes competition the disqualification penalty for not correcting the error should stand. The course manger just look like referee in our club, he has buggy and stop watch etc.. while all players were walking in the competition, only referee had buggy. In this case, a course manager showed up with buggy and stop watch, could this change the ruling? If the player had played a provisional ball before searching, he could have declared the original ball lost and played the provisional with only the loss of a stroke. Player A hits his tee shot out of bounds (1 stroke). He hits a provisional. His first ball is out of bounds, but he can play his provisional ball as stroke 3. You cannot declare a ball lost. See my blog on this subject dated 20th April 2010. If, in the circumstances that JQ described in the above comments, the player had played a provisional ball he would not have been able to play it once he found his original ball in the bush, even though he deemed it unplayable. Player A hits a ball that may be out of bounds. Announces that he will play a provisional ball. Finds the provisional ball. After searching for five minutes, cannot find the first ball. Under 27-2b, he could play his provisional ball, and it would be his fourth stroke when he hit it. Of course, that is the whole point of playing a provisional ball, to save time if you cannot find your original ball, or it is out of bounds. I recommend that you scroll up this page and enter the words "provisional ball" in the 'Search This Blog' box. You will receive links to several blogs that I have posted on the subject, the first four of which are the most relevant. Is there a good reason why a provisional ball is not allowed to be used in any circumstances where another ball needs to be played from the original position. On a par 5 I hit my second into trees just to the right of the green. I hit a provisional onto the green, not close, but not three putting territory. My thoughts walking down are that if I can see my original ball without looking for it I'll play it, but if not, I'll walk on and take my chances. A friendly playing partner, genuinely trying to help found it before I got there or asked him to stop looking. It was unplayable. None of the other options worked and I had to walk back and play from where I hit the original shot. A fair amount of time was taken up. Why do the rules not allow the provisional ball to be used in any circumstances where returning to play from the original position is a possibility? I can't see any undue advantage and I would still have the same question if I had bleached the provisional into the trees too! I do not pretend to have any inside information as to why the Rules do not permit you to play your provisional ball if your original ball is found in bounds, but you deem it unplayable, but I will offer an opinion. The Rules of Golf do not offer players the option of choosing between two outcomes when one of them is already known. If you deem a ball unplayable, you have three options (see Rule 28). However, knowing where your provisional ball has come to rest could influence which option you choose. If the stroke at the provisional ball was a good one, continuing play with it might be your preferred option, but if it was a bad one, you would probably want to use one of the other options for taking relief from an unplayable lie. This would provide you with an unfair advantage and would encourage players to play a provisional ball every time that their original ball was out of sight, which would obviously cause more delays than under the current Rules. What if a spectator mentions to a player they should ask for an official to see if they can get relief... and the player then asks for an official??? In my opinion, that intervention by a spectator would not incur a penalty; in the same way that if the spectator said, "you are entitled to relief there", it would not incur a penalty.